When you run a digital advertising campaign online and on social media with Citizen Reach™ you can follow its performance on a dedicated series of dashboards updated each week. 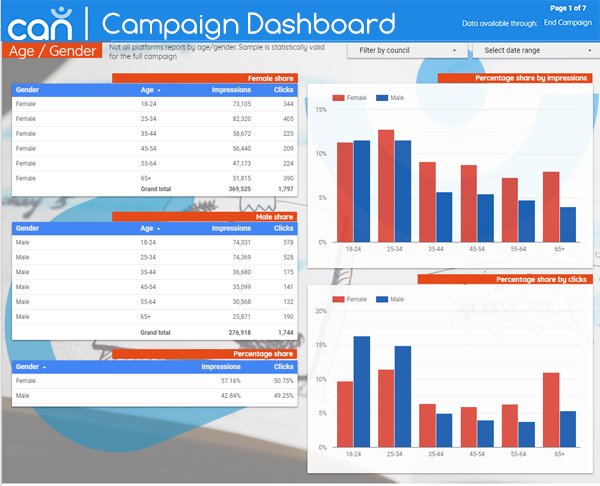 The dashboards ­– on Google Data Studio – not only give you the latest statistics on campaign reach, impressions and clicks, they also show you how different creatives, platforms and devices are performing for your campaign, and how many people are engaging by postcode, age and gender. They are refreshed every Monday, and the stats are presented in easy-to-read formats like pie and bar charts, simple graphs and tables – all making it easier to share your campaign’s progress with colleagues. Here’s what you’ll find in your campaign report. Impressions – the number of times your ads are displayed across all platforms. 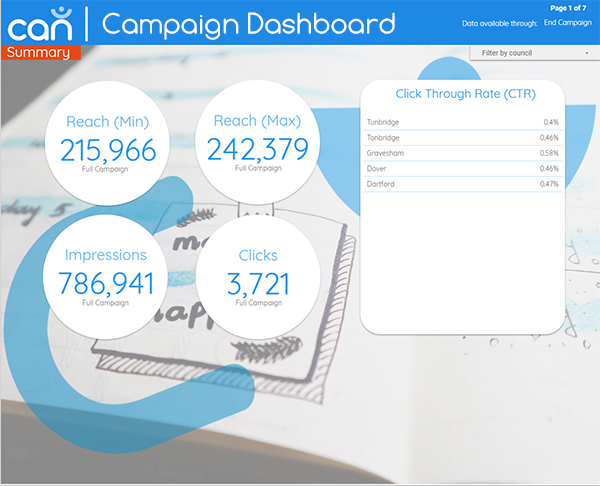 Reach – the minimum and maximum number of people who could see your digital campaign. Clicks – how many times your campaign ads prompt people to click to find out more information. Click-through rate (CTR) – the number of clicks your campaign ads get divided by the number of times they are shown. The average CTR for display advertising across all industries is currently 0.35% – so if yours beats this, you’re doing well! The top 20 social channels and websites your campaign ads are placed on – to best target the people you want to reach. Graphs that show you how many impressions and clicks your ads get for each day of the campaign. Hover over the graphs and the daily stats are displayed. You can see at-a-glance the days when there are spikes in engagement. How the different ad formats and creatives used in your campaign perform in terms of impressions and clicks – presented as tables and bar charts. For example, find out how banner ads on mobile phones are doing compared to standard-size social media ads. Or how one image or message is faring against another. Not all channels report this information, but you can look at your campaign performance by postcode if it’s available. 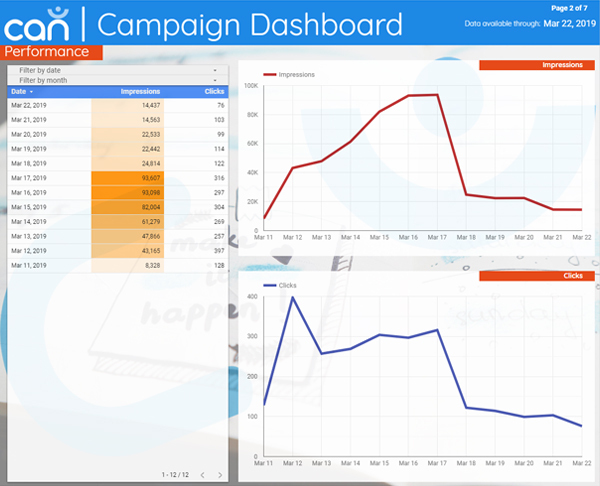 Campaign impressions and click statistics across different age groups and genders presented as tables and easy-to-read bar charts. Check the tables and pie charts to see if your campaign is performing better on mobile, tablet or desktop – by impressions and clicks. How does Citizen Reach™ work? It’s a low-cost way to get your campaign messages across online and on social media that’s targeted at the people you want to reach. Your campaign messages are displayed as digital adverts and people click through to the relevant page on your council website to view your call to action and more information. The sites and social channels your campaign ads appear on are determined by anonymised data profiles of individuals’ browsing habits (‘programmatic advertising’). We monitor your campaign while it’s running to determine which messages, creatives and channels are working best, and adjust it to make sure you get the highest performance at the lowest cost. Take a look at these case studies and find out more about Citizen Reach™.